Toronto Hit List: Gone Wild, The Beatles vs. The Rolling Stones, Body Heat, Junction Night Market & more! June 15th-17th TIFF POP: Virtual Reality & Real World Storytelling @ TIFF Bell Lightbox, 350 King St. W. In TIFF’S second POP exhibition, you’ll get the chance to experience some of the best virtual reality storytelling that’s been done to date, and also to question the limits of the technology and the ethical questions it raises. From escapist fun (take a drive around Mars! Wander an alien world!) to immersive VR documentaries to a one-of-a-kind room-scale augmented reality experience, you will leave this installation with some new views on things. Tickets available online. 5 pm Summer Pop-Up Series @ Tokyo Smoke, 850 Adelaide St. W. Bringing you the best in local designers and talent, the Summer Pop-Up series is a place to shop, relax, grab a bite and a brew, and enjoy the summer night! Sip on Tokyo Smoke’s custom roast coffee while you shop the latest designs by Mary Young and Saltwater Collective. Treats and drinks from 7-10 pm. 8 pm The MUFF Society Presents: Tank Girl @ Carlton Cinema, 20 Carlton St. Join the MUFF Society for an explosive screening of Rachel Talalay’s Tank Girl, starring Lori Petty (yesss), Naomi Watts (yesssss), Malcom McDowell (yesssssss), and Ice-T as a mutant kangaroo (wait, what? Eh, alright: yessssss). Lobby fun at 8 pm, screening at 9. Advance tickets available online. 9 pm Yonatan Gat @ Smiling Buddha, 961 College St. Yonatan Gat first came to prominence as the guitarist and founder of Monotonix, and was named “Best Guitarist in New York” by the Village Voice in 2013. He’s since started writing and performing under his own name, releasing EPs Iberian Passage in 2014 and Physical Copy in 2015. $10 at the door. 8 pm Spelling Bae @ The Ossington, 61 Ossington Ave. The ultimate spelling competition. Official Canadian spelling bee rules observed. Spell words, drink beer, compete for glory. Sign-up at 8 pm, Spelling Bae at 8:30. 9 pm Free Salsa Night @ Fonda Lola, 942 Queen St. W. Every second Thursday of the month, authentic Mexican bistro Fonda Lola hosts a muy caliente night of salsa celebration! Pushing the tables aside for a free salsa lesson on their hidden gem Queen West patio. This after dinner lesson will be taught by Christine Walker of Walker Dance Studios, with live music by the festive Sol De Cuba band and Fonda Lola serving up $5 beers, $6 tequila shots, and $8 cocktails for the occasion (until 1 am). 10 pm Soul Step @ The Red Light, 1185 Dundas St. W. A new monthly party for modern soul and rare groove, hosted by Cam Hildebrandt. Music to make you step. 5 pm Adult Colouring @ The Gladstone Hotel Melody Bar, 1214 Queen St. W. Let your inner child out and kick it old school with the Gladstone’s adult colouring-in every Friday from 5 pm to close! Grab a beer and groove to some tunes while trying to stay in the lines. All supplies included. 10 pm Rebel Hop @ The Piston, 937 Bloor St. W. Soul, funk, reggae, hip-hop, dancehall, and their relative disciples with DJs Gramera and Linx on the decks + Dennis P on the sax! $10. 10 pm Dirty Talk @ Unlovable, 1415-B Dundas St. W. Pammm and Diana play Italo, cosmic disco, ’80s Euro synth, Montreal sound, and weird dad jams. 10 pm Lover’s Rock Showcase @ Bambi’s, 1265 Dundas St. W. Join Ital (NYC), DJ Wey (NYC), and CL (TOR) as they submerge your mind and trance-port your soul to a world of foggy beach raves and dubby cosmic dreams. $10 in advance. 10 pm Sweat Pants @ The Ossington, 61 Ossington Ave. DJ Coolin spins the ultimate smooth party groove. Hip-hop, dancehall, soul, RnB, reggae – everything you need. 10:30 pm Rock Steady: Grunge Rock Edition @ The Steady, 1051 Bloor St. W. Grunge rock night with DJ Kash2Go! Always queer friendly. 11 am The Trinity Bellwoods Flea @ Studio Bar, 824 Dundas St. W. The Trinity Bellwoods Flea is back with a fresh lineup of local artisans and vendors, music, and cocktails! Featuring some of the city’s best in art, collectibles, handmade, fashion, and vintage + a fun and funky mix of all your favorite summertime toe-tapping songs! Until 5 pm. 11 am Maker’s Magazine Launch Party & Pop-Up Shop @ RAWspace, 270 Carlaw Ave., unit 102. Join Maker’s Magazine as they celebrate the release of Issue 2: The Morning, and shop an awesome collection of vendors! There will be magazines for sale, yummy snacks, Canadian made brands, free raffles with a chance to win a mag, and a free jewellery workshop with RAWspace. Until 5 pm. 11 am Summer Celebration @ Tiger of Sweden, 56 Ossington Ave. Receive up to 50% off Tiger of Sweden’s spring collection and 30% off their summer collection; enjoy complimentary Steamwhistle beer and prosecco, and snacks from Cote de Boeuf; a live DJ set by Mike Juneau of Record Collective; and a pop-up shop by Stylish Fox. Until 6 pm. 7 pm Junction Night Market @ Pacific Avenue, just north of Dundas St. W. A community night market showcasing local food and drink in the Junction! Featuring prepared food vendors from the neighbourhood’s weekly farmers’ market, local restaurants, breweries, cideries, and wineries. Food and drink tickets are $5 each, with all proceeds helping members of the community gain access to fresh and healthy food through programs such as the Junction Farmers Market Food Voucher Program in partnership with the Four Villages Community Health Centre. Until 11 pm. 9 pm All Night Long Presents: The Beatles vs. 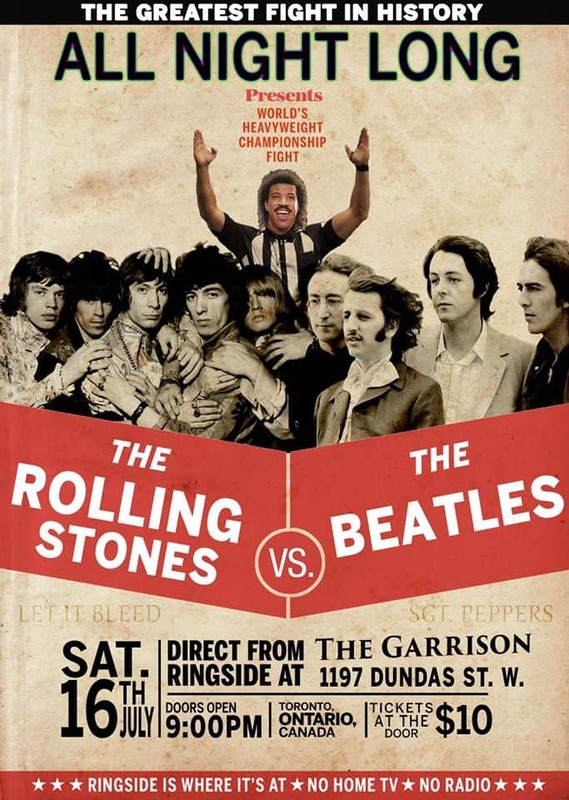 The Rolling Stones @ The Garrison, 1197 Dundas St. W. All Night Long invites you to witness a true clash of the titans, with live performances of The Beatles versus The Rolling Stones. The night kicks off with Sgt. Pepper’s Lonely Hearts Club Band, followed by Let It Bleed, and then all their hits. Show starts at 10 pm. $10. 10 pm Body Heat @ Bambi’s, 1265 Dundas St. W. Sliiiiide back into the grotto with J-UL, Andycapp, and Myth Paradise. Soul, disco, and house music melters. $5. 10 pm Love Handle @ The Rivoli, 334 Queen St. W. The funk is hittin’ the fan as locals Alister Johnson, Sonny Dunn, and Famous Lee play the music to make your body rock! ’80s funk, disco, modern soul, and boogie, all on vinyl. Free before 11:30 pm. 10 pm Glitter Box @ The Steady, 1051 Bloor St. W. Get out of your boring box and come to the GLITTER BOX! It’s gonna be a puuuuuurfect night with DJ Kitty playing all your favourite guilty pleasures from the ’80s, ’90, and ’00s. 10 pm Buffy: The ’90s Dance Party @ Sneaky Dee’s, 431 College St. Buffy, Xander, Willow, Spike, and the rest of the gang are facing a new threat and it has sent them back to the ’90s! They need your help to dance them away. Make sure you dress the part or you’ll be spotted, and watch out for The Gentleman. $5 in advance and at the door. 10 pm Party & Bull$hit @ The Shop under Parts & Labour, 1566 Queen St. W. A night of rap bangers and other trill $hit with DJs FBomb and Ry-Fi. Free before 11 pm, $5 after. 10 pm Shake, Rattle & Roll @ Clinton’s, 693 Bloor St. W. The Bangs & Blush ladies roll out all the hip shakers and baby makers from the ’50s and ’60s for you to drink, dance, and get messy to. $5. 10 pm Get It Together: Superb Edition @ The Boat, 158 Augusta Ave. Kensington Market’s open format dance party welcoming all genres, all styles, and all people. Selections by Mikey McFly. $5. 10 pm It’s All Good @ The Piston, 937 Bloor St. W. Splattermonkey and General Eclectic spin all-90s hip-hop, house, and rock! The best all killer and no filler selections from 1990 to 1999, so expect to hear stuff like Wu-Tang, Pixies, Nirvana, etc. Nostalgic moments guaranteed, because It’s All Good, baby! $5. 10:30 pm Back In The Day @ Revival, 783 College St. A tribute to ’90s and ’00s old school with DJs Lissa Monet, D-Smooth, C-Lo. Email info@themarqueemedia.com for bottle service inquiries and guest list. 11 pm Stuck On Stupid @ The Drake Underground, 1150 Queen St. W. DJs Fase and Dougie Boom throw a no-holds-barred, anything-goes, sky’s-the-limit, all-out dance-a-thon! Expect hits and not-so-hits, jams old and new. $10. 10 am The Leslieville Flea @ Ashbridge Estate, 1444 Queen St. E. A curated market selling vintage, salvaged, up-cycled goods, furniture, antiques, collectibles, and select artisans. Free entry. Until 5 pm. 10 am Yoga in High Park @ 1873 Bloor St. W. (just to the right of the front gates on Bloor near the Chess House). Flow-active is running a FREE summer-long yoga series! The styles will vary week-to-week, but will always accommodate beginners and welcomes people of all ages. This week’s session will be led by Moksha Yoga Bloor West. BYO: yoga mat, sunscreen, and friends. 11 am Detox to Retox @ Henderson Brewery, 128-A Sterling Ave. Led by a certified yoga instructor and followed by a tasting of beers, this two-hour session (one hour of yoga, one hour of beer) will be the perfect way to trick yourself into thinking that you’re working out really hard. $30 advance tickets available online. 2 pm Bastid’s BBQ @ Honest Ed’s parking lot, 581 Bloor St. W. DJ/entertainer Skratch Bastid is bringing Bastid’s BBQ back to Toronto! Unite over some great music provided by a cast of world-class DJs, including headliner DJ Jazzy Jeff; live performances by special guests; and primetime food provided by La Carnita, Home of the Brave, and Sweet Jesus. Advance tickets sold out; limited number available at the door. 2 pm Bollywood Classic Series: Umrao Jaan @ Aga Khan Museum, 77 Wynford Dr. This series presents films that influenced the genre as it developed from the 1960s to the present day and showcases the arts and histories of Muslim civilizations. Discover why Bollywood actress Rekha won accolades for her performance in this classic adaptation of Mirza Hadi Ruswa’s 1905 novel! $10 advance tickets available online. 6 pm Christie Pits Film Festival @ Christie Pits Park, 750 Bloor St. W. The Christie Pits Film Festival celebrates its sixth summer season! This week, recent Oscar nominee Mustang leads a pack of four female-directed films. Eats and treats provided by Sugar Mama’s mini donuts and feasTO. BYOBlanket. Free / PWYC ($10 suggested).